No one is more lonely than a person living in a one bedroom or a studio apartment in a big city. Personally, I’ve never tried it because I come from a huge family and anytime I’m alone in the house I freak out and turn on all the lights and the radio and the television, but I have lived in big cities and I do know that meeting people can be surprisingly hard. I wish that Keigan Ashall’s site, CleverTower, was around when I was living in NYC. 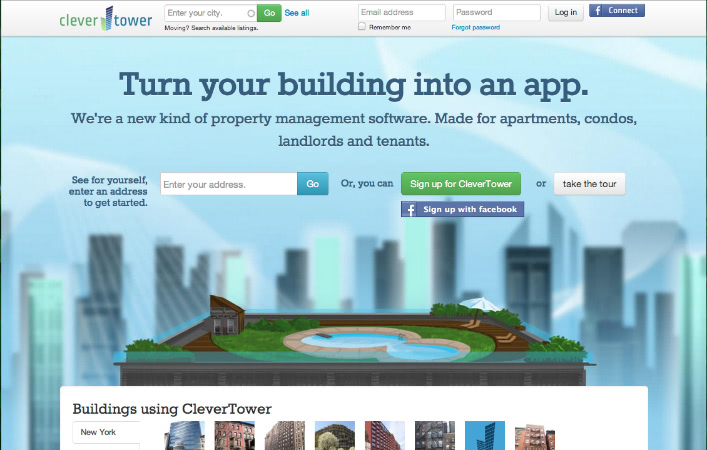 CleverTower has two sides to it: one for the landlords and one for the tenants. On the tenant end, this site is basically a social networking site for your apartment building. You can build a little profile, share info with your neighbors, and generally get an idea of who you’re living with. For landlords, the site offers an easy system to manage multiple properties and deal with everything from repairs to late payments to tenant expenses. 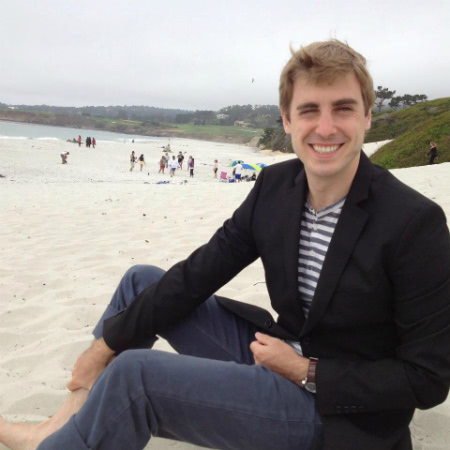 Keigan, startup founder and the brains behind CleverTower, and I chatted through a spotty Skype connection about what inspired him to start CleverTower and how a fortunate intersection with the launch of Google Fiber means that a huge portion of his users are in Kansas City. So let’s talk about your website. I love the concept, first of all; I think it’s great. What was your original vision for it? The reason I started it is I was constantly moving into high rises, right? I moved every single year and it was just really impersonal. I’d move to apartment buildings and I’d move in between places and I could never really meet anyone. I would see the same faces and you know how it is with your neighbors, where you that awkward hi/nod thing? I thought it could be better than that. That’s one side of it. The second side is that there’s a certain relationship you have in your building that’s unique. What I mean is that the people in your building, the people that you’re around aren’t your friends or your colleagues; they’re your neighbors and that’s a unique relationship. The second thing is that the place that you’re living at isn’t home. You’re not living with your parents, you’re living with a landlord. You’re living on someone else’s property, as is everyone else around you. I wanted to encompass all of that, starting with the idea that you’re living in a managed space with a landlord, that you have neighbors around you and that you all live together. So that’s what Clevertower is. Clevertower is designed to bring tenants and landlords together and have a space for them online, in the same way that so many of our other relationship have moved online. And has your vision changed much from the beginning or has it stayed pretty consistent? No, it totally changed. For one thing, I was originally going for the landlords. The reason I started it was because of the social aspect but there’s also the administration that landlords have to do. My landlord had a reasonably big property management firm with like 5,000 units and everything was on pen and paper and when something broke it would take forever to fix it. You probably have the same thing. You tell your landlord like, hey, my electricity is broken and he’s like, oh, okay, and then you wait a week. I wanted to make a system more for the management of problems. When we started going at it in the end of July, the first people to start using it were people in Kansas who wanted to get Google Fiber. Google started doing a contest to decide which buildings were going to get this because they have to install all of the networks so they said whichever area gets the most signups, that’s what we’re going to do. So we took a look at that and started saying, hey, if you want Google Fiber come sign up for your building for this service and this is a way to talk to people in your area. That resonated with people and like half of the signups that we were getting were from Kansas City alone. It’s an obscure place and it’s really random but the Google Fiber launched in Kansas City and it got people onto our system. Most things aren’t neighborhood based anymore so in our launching strategy we’re looking for ways to help people to interact with their neighbors. So when we capitalized on the Kansas City thing we were like, okay if people want Google Fiber and they don’t have a way to talk to their neighbors, this is it. And is this currently aimed at apartment buildings or do you do smaller apartment buildings? What’s the demographic? The average units for the buildings is 80. Okay, so pretty big buildings? It’s more for bigger buildings than for small ones. That could be because of the launch, because you’re more likely to have someone sign up to be in an 80 person building than a 6 person building. That could be it. So far it’s been larger buildings. I know even when I was living in New York I lived in smaller building and I lived there for a year and half and I didn’t know one of my neighbors, even in that situation. Yeah, didn’t know anyone huh? It’s just kind of funny how that works. We’re aiming to put a face to a name like, hey, I also live here. I don’t think it will change your behavior and your neighbors’ and now they’re your new best friends but at the very least you know who they are. What about issues with stalking? Is that something you guys have thought about? There’s privacy control so if you really don’t want to appear to your building, it just takes one click. It’s pretty easy. What about your personal background? What brought you to this place? So, I’m not your average computer science guy. I think a lot of startups are made for computer science but I never thought I’d do a startup. I started in finance and I was a structured products manufacturer. I would model derivative transactions that were for sale in the retail market. You know how when you hear online or on the news about complex financial vehicles that people don’t understand? Like when they were talking about the credit crisis and how the problem was that people didn’t know what they were buying? My job was to make them less complex. I was the guy who understood it and understood the back workings of it. It was a pretty computationally demanding job so I learned programming and I enjoyed it but I decided okay, I’m going to take these skills and apply them to a startup. The idea was you’re only young once so launch it, do the best you can, and see what happens. Do you have any advice for other people doing the lean startup thing? It doesn’t have to be perfect. We started developing a year ago and if I did it again I wouldn’t take so much time. I was a bit more conservative and I would get a little nervous about launching; like with everyone seeing your stuff and you only have one shot to make a good first impression, so make it count. In the very end, though, marketing is what really matters. It’s really about getting the word out and if it’s so-so, it’s okay. I have to say, I really like the design of the site. It’s very simple and it’s very clear. So many sites are really busy and I think it’s hard to make a site this clear. That’s more Will. I have the background in modeling but he’s been a web designer for the past three years. We met through a startup event. I started this on my own and we met later and we joined forces. Like a meetup kind of thing? I guess the number one thing I want to add is, “Keep at it.” If it’s advice for young entrepreneurs, it’s keep at it because you never know where your muse is going to come from. Stay positive.